When I was growing up, my family went out to eat once a week, on Sunday night. This may sound fancy, but, really what we did was go to "the driver's choice" of restaurant, aka, my dad's choice, which alternated between Del Taco, Papa Ginos, and Subway. When the previous two closed, Subway became the family standard. I kinda hated it, as I've never been a huge lover of sandwiches, but I got to mix my own drink at the soda fountain, and perfected a mix of orange soda, root beer, and I don't remember what else, which is really all I remember. Oh, and the pickles. I always liked the pickles. Anyway, I didn't visit for years. Likely ... 20? I had no reason to ever return to a Subway restaurant. Until ... T-Mobile did a promo where T-mobile customers got a free 6 inch sub of the day on Tuesday. You know I can't resist freebies. A few weeks later, they did it again, offering up free cookies. What can I say, I went back. So, to Subway I went. Unfortunately, the sub of the day was chicken, and I don't like chicken. My favorite Subway sub was always just the Veggie Delight anyway, so I figured this wasn't a big deal, I'd still get the veggies, and I could just ask to have the chicken left off. It seemed like a simple request. "Then it would be a veggie delight, which is not the sub of the day, and your promo is not valid for that", was the response. I tried again, saying, you can pretend to put the chicken on, just, don't. It wouldn't fly. Well then, ok. So I asked to have the chicken on the side. 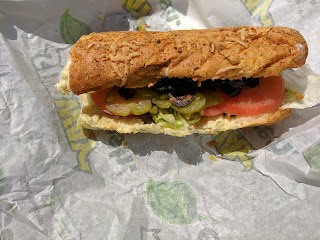 The first person making my sub did indeed leave it on the side, but, as my sub progressed down the assembly line, each and every person decided to add it back in. I eventually gave up. There was no getting away from the chicken breast. I didn't bother try it, since I don't like chicken, and this was surely not going to change my mind. It was a thin strip of chicken with fake looking grill marks on it. I can't say my trip to Subway was a success, but, mostly it was really just poor management at that particular Subway. My visit was at 12:30pm, and they were out of almost all types of bread. Isn't that prime sandwich time? The line was ridiculously long, but the bottleneck was not the ordering section. It was long to checkout, which made the line backed up all the way through the ordering stations. There were at least 10-15 people in front of me in line, I was no where near the counter, couldn't see the options or anything, and had a worker asking me what I wanted. From way back in line I tried to call out my bread choice and protein. It was ridiculous shouting past all the people, but, the staff were insisting that people keep ordering, even though we were so far away. It got more ridiculous as our subs progressed down the line, moving to the next station to have more toppings added, as we got progressively further and further away. The staff really didn't seem to care though, just slapping things on and looking very bored. When I asked for "extra pickles and black olives", I got an eye roll. I don't think anyone took their "sandwich artist" titles very seriously. Oven Roasted Chicken, Italian Herbs & Cheese Bread, 6 inch. "The Oven Roasted Chicken you love is piled high atop freshly baked bread with your favorite toppings from spicy jalapeños to crisp green peppers." I added cheese (Swiss), most of the veggies (leaving off spinach and cucumbers, but including lettuce, tomato, green pepper, red onion, banana peppers, jalapeños, pickles, black olives), plus extra pickles and black olives, and Creamy Sriracha sauce. When I visited my family over the summer, my little sister ordered a sub at Subway and asked to have it toasted, something I hadn't ever done before (did Subway toast sandwiches back when I used to go?) But not only did she have it toasted, she had her onions and peppers toasted with the cheese. I thought this was genius. So I tried to replicate that here, asking for my onions and all the different types of peppers to be added with the cheese before toasting. After it came out of the toaster, I had them add the rest of the veggie toppings and the dressing as usual. When my sister did this, it looked great. I think she had a steak and cheese, and it really did almost look like a Philly cheesesteak. Her peppers and onions got soft, her cheese perfectly melted. The same did not apply to mine. It was toasted for only a second. The bread didn't really get toasty, the veggies weren't softened at all, and the cheese wasn't melted. What was the point of toasting? For bread, I went with Italian Herb & Cheese after my other choices were not available. It was stale tasting. I thought Subway was all about fresh bread? The lettuce (shredded iceberg), green peppers, onions, banana peppers, and jalapeños were all pretty standard. Not particularly great, but not bad. The tomatoes however were not good. Thin, anemic looking slices, mealy. It was summer, so, no excuse for bad tomatoes. The pickles and sliced black olives I did love though, and they were pretty much what I remembered from childhood, hence the ordering extra. It was my first time trying the creamy srirracha, a bit random, but, I wanted some flavor and I wanted to try something different. In the past, I always went for mayo or the sweet onion sauce. I sorta wish I had stuck to my old standbys, but, the creamy srirracha was ok, creamy, a bit spicy. Overall, this sandwich really could have been ok. It had potential. But the staff just really not caring as they threw it all together, and the stale bread, really just made for a sub-par experience. The guy behind me clearly knew what he was doing. He also got the oven roasted chicken sub of the day, but turned it into a chicken parm! He had them add marinara sauce (usually for the meatball sub) and had provolone melted on. Totally different than what I'd expect from that sandwich, and, assuming he got it remotely hot after making his way all the way to checkout, I'm sure more exciting. Near the register, at every Subway, is a display of cookies. The standard lineup is chocolate chip, double chocolate chip, white chocolate macadamia, M&M, raspberry cheesecake, oatmeal raisin, sugar, and peanut butter, but they also introduce seasonal varieties from time to time, like Pumpkin Spice or Apple Pie. Since I'm not a cookie girl, even back when I used to frequent Subway, I don't think I ever got these cookies. But, two free cookies, who can resist that? 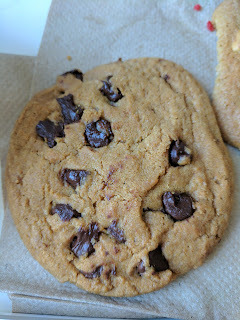 For my first cookie, I went with the classic chocolate chip, mostly intending to bring it to Ojan. It was a totally boring, hard, crispy cookie that looked like it should have been softer. Perhaps it would be good warmed up? It had a decent amount of chocolate chips at least. For the second choice, I went for one I wanted: white chocolate macadamia. It was, sadly, the same hard style as the chocolate chip. 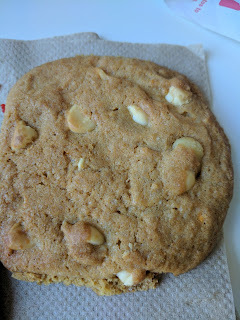 Like the chocolate chip, it had a good amount of white chocolate chips, and a decent number of macadamias. But, it was just too crispy to be the type of cookie I'd ever like. Soft and gooey is the only way I ever enjoy a cookie.